Niacinamide was one of the first skincare products I ordered from DECIEM’s The Ordinary, and over the course of about four months, I used up a full 30 mL bottle. The product’s full name is Niacinamide 10% + Zinc 1% High-Strength Vitamin and Mineral Blemish Formula, and it is meant to fade blemish spots, reduce skin congestion, and brighten skin tone. As per instructions, I did not use any Vitamin C with Niacinamide; other studies have suggested that use of these two in conjunction on the skin may not be a problem—for example, the TIA’M Vitamin C serum I am using at the moment actually contains niacinamide, as well!). However, I wasn’t introducing any Vitamin C to my skincare routine at the time I was trying out the Niacinamide, so I did follow DECIEM’s recommendation by default. This review is a long time coming! I’ve had a bit of a skincare misadventure over the summer, but now, I’ve finally used DECIEM’s popular “Buffet” peptide serum for several months and feel that I can give it a more detailed review. Earlier this year, I was looking to overhaul my fairly basic skincare routine and picked up several skincare products from DECIEM’s The Ordinary, a line of pared-down products. I was never much of a serum-user, as my routine pretty much consisted of cleanser plus moisturizer, but having read a lot about serums—and about the Korean 10-step skincare routine, in particular—I was determined to expand my skincare horizons. 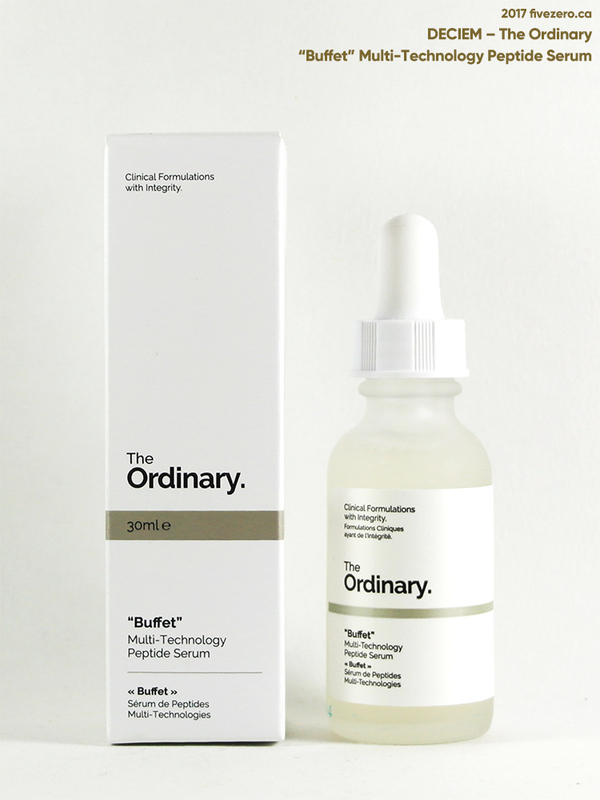 The first product from The Ordinary that I worked into a routine was the much talked-about “Buffet” Multi-Technology Peptide Serum, which retails at a quite low price of CA$14.80. 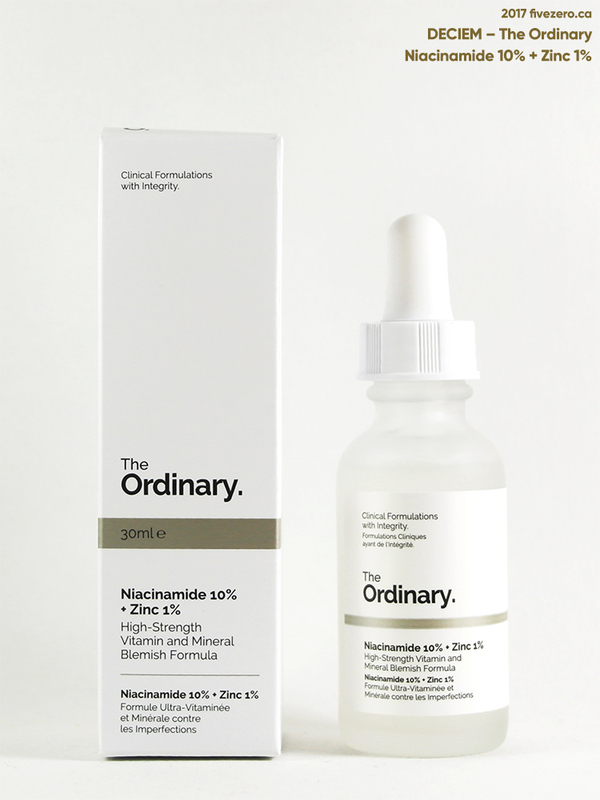 Other peptide serums can cost upwards of a couple hundred dollars, for the same 30 mL, so I was both very curious to see how effective The Ordinary’s product could be. For reference, here are some prices of peptide serums on beautyBOUTIQUE/Shoppers Drug Mart, Sephora Canada, and Well.ca. All prices are in Canadian dollars. For products available in multiple sizes, I used the largest, most cost-effective size. Before I started, I didn’t realize there were so many! But hey, gotta add them all. Before I go into the review, Toronto-based DECIEM came out with some big news yesterday—they’ve sold a stake in the company to Estée Lauder. The optimist in me wants to say good for them! And that this new injection of money will seriously improve their production and distribution, particularly considering the issues they had upon the recent launch of their first colour cosmetics. The pessimist in me realizes that The Estée Lauder Companies is one of the world’s largest cosmetic conglomerates, with brands like Clinique, MAC, Too Faced, Bobbi Brown, Tom Ford, Becca, Origins, Smashbox, La Mer, Aveda, Jo Malone, Le Labo and more under its umbrella. It seems possible that formulations might become altered, prices may start to increase, and some of the things that I personally liked about the company will change: being local, cruelty-free (Estée Lauder is not cruelty-free), and the values they claimed to have about honesty in skincare. Each box DECIEM mails out has ABNORMAL BEAUTY COMPANY emblazoned on it in bold, sans-serif letters. It rings a bit false now that there’s a beauty behemoth behind the scenes. In any case, Brandon Truaxe will remain DECIEM’s CEO (he has previous with launching a company only to sell it, and was also a founder of Indeed Labs). The company’s fans, including myself, will have to hope that this move allows DECIEM to grow comfortably, without losing sight of what made them so very popular in the first place. This week, I test drove Canadian skincare brand DECIEM’s first foray into color makeup with one of their two new foundations. 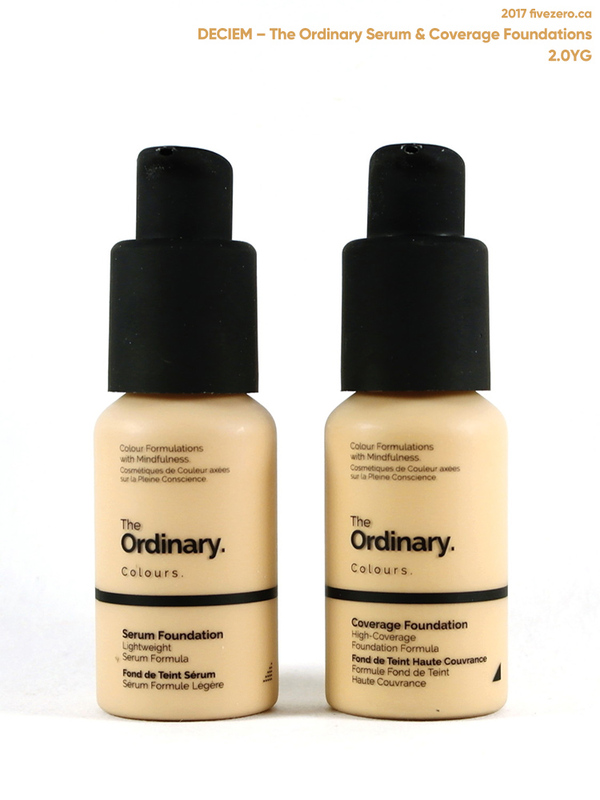 In April, they released a Serum Foundation and a Coverage Foundation under one of their brands, The Ordinary. I picked up both in the color 2.0YG (Light Medium, Yellow Undertones with Gold Highlights) for my NC25–30 skintone. Last week, I reviewed the Serum Foundation, and I wasn’t a huge fan. Today, I’m reviewing the Coverage Foundation, which, obviously, is meant to provide more coverage. It claims a light cream texture, full coverage, higher pigmentation than the Serum Foundation, and a semi-matte finish. The shade I got, as indicated by the “G” in the name, has additional subtle gold highlights mixed in. In April, they released a Serum Foundation and a Coverage Foundation. I picked up both in the color 2.0YG (Light Medium, Yellow Undertones with Gold Highlights) for my NC25–30 skintone. Today, I’m reviewing the Serum Foundation, which is the more lightweight version. It claims a light serum texture, medium coverage, excellent pigmentation, and a semi-matte finish. The shade I got, as indicated by the “G” in the name, has additional subtle gold highlights mixed in. The formula is fairly liquid and serum-like, and it is indeed well-pigmented. 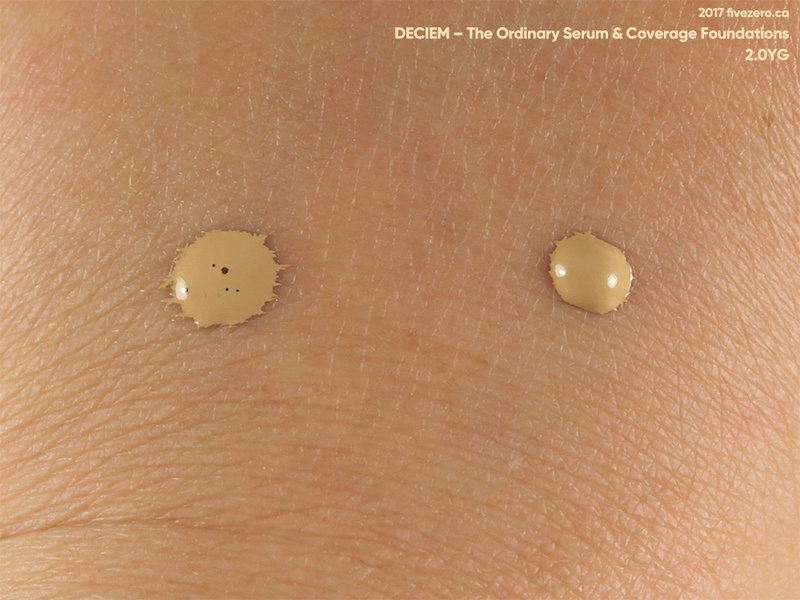 In April, skincare company DECIEM released their first ever The Ordinary Colours makeup in the form of two foundation products. And, in keeping with The Ordinary’s high-impact, low-cost business model, the foundations are both a mere CA$6.70 for each 30 mL bottle. Isn’t that wild? So, as you’d imagine, they were extremely popular products and the company ended up having trouble fulfilling all the orders in good time. They released an explanation and an apology, and I was delighted when my foundations finally arrived! Both foundations come in the same range of 21 shades, which is quite impressive. Here is their handy Shade Guide. I ordered both products in the same shade: 2.0YG (“Light Medium yellow undertones with gold highlights”) for my NC25–30 skintone. The “2.0” indicates it is the lightest of the medium shades, the “Y” indicates it is yellow-toned (P = pink and R = red), and the “G” indicates a very fine metallic gold effect (S = silver effect, and most shades do not have a metallic effect at all). For some reason, 2.0Y does not exist. 1.2Y seemed too light and 2.1Y too dark, so I threw caution to the wind and went for the gold effect. 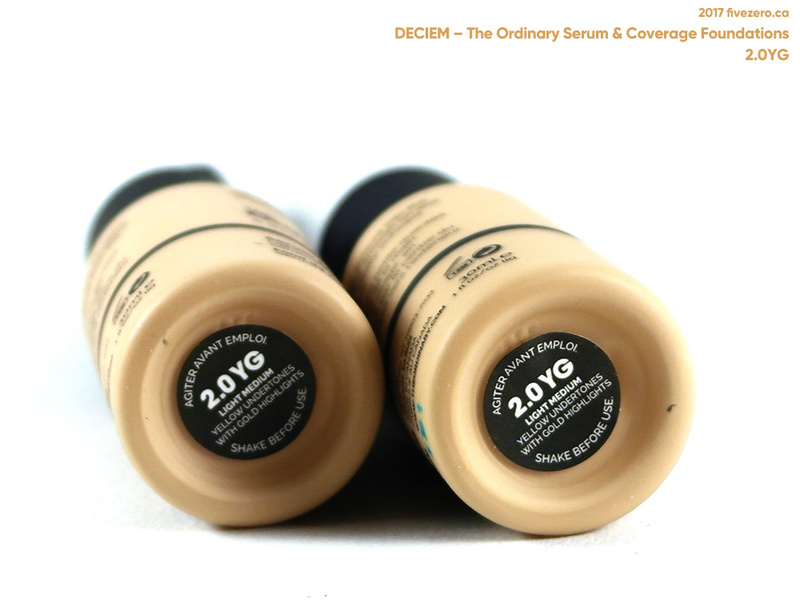 The Serum Foundation is described by DECIEM as a “lightweight pigment suspension system with moderate coverage“. The Coverage Foundation, by contrast, is a “high-spreadability pigment suspension system with high coverage“. As you can see, the colors look very close in their bottles (at least I am pretty sure that the bottles are clear—the foundations fully coat the insides! ), with the lighter-coverage Serum formula appearing just a hair lighter/less yellow-toned. I am also very thankful that the bottles are plastic! I am always so leery of accidentally breaking The Ordinary’s glass skincare bottles. These foundation bottles and their pumps feel nice, with a slightly matte finish. I’ve been wrestling a lot with my skin lately, thanks to not sleeping nearly enough since my two kids and my husband have been hit by norovirus, colds and coughs. When I don’t sleep enough for a few days running, my skin instantly reacts by developing cystic acne along my jawline and generally just looking like crap. So, dry and flaky winter skin, plus hormonal/stress-induced acne. Not happy days. I’ve been trying to sleep more (not really possible sometimes, though) and drinking more water, but all of this prompted me to seek out some topical assistance over the weekend. I settled on trying out skincare from The Ordinary, who specialize in pared down skincare products with just a few essential ingredients—all at amazingly reasonably prices. The brand was launched in 2016 by Toronto-based skincare company DECIEM, and it has been a crazy hit, so I felt pretty safe in trying out several products from them all at once. Here’s what I ordered (they’re sold online in Canada at their official site, which is where I placed my order, and at Well.ca (referral), who carry The Ordinary and another DECIEM brand, Hylamide, and were already sold out of most items). All prices are in CA$. The Caffeine Solution is for my husband, who has undereye circles he would like to address. He’d also like to try the Azelaic Acid for his mild rosacea. 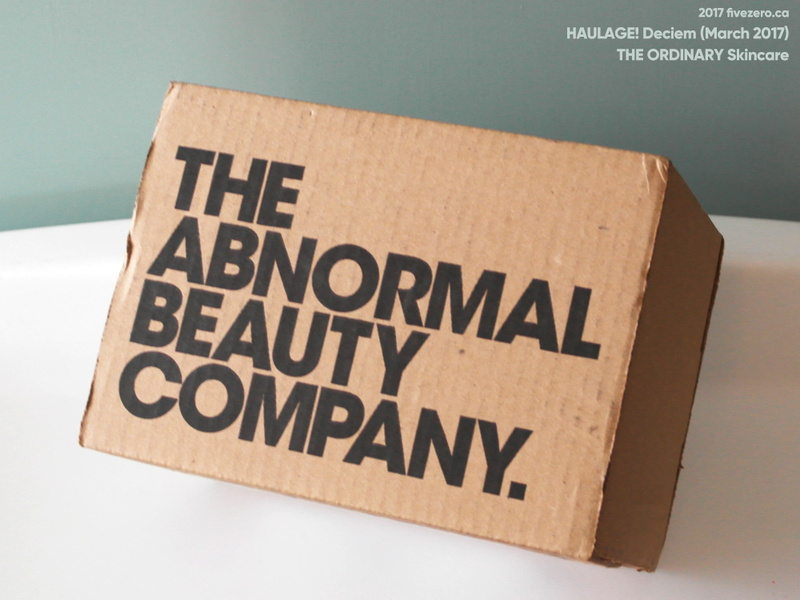 I was tempted to pick up something from one of DECIEM’s other, higher-priced lines, but in the end I decided that I’d wait to see how I liked the Ordinary products, first. The website stated that due to high demand, my order might not be fulfilled for 10 days. However, they literally shipped it the day after I ordered (Sunday) and it was delivered to me in Toronto on Tuesday. Now that’s service!